Games consist of two 18-minute periods. (Junior age and up play 20 minutes). Each team has 6 players on the ice at any time: 2 defense; 2 forwards; 1 centre; and one goalkeeper. Play is with a regulation Ringette stick and a round, rubber ring. Players must pass the ring over the blue lines as they move up and down the ice. 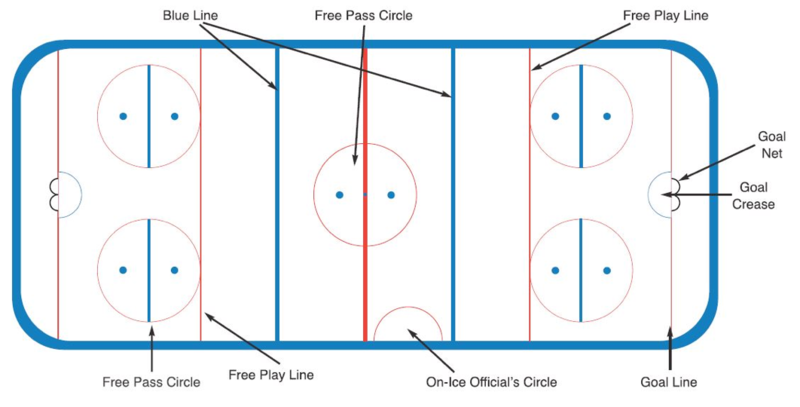 The rink consists of three zones, two end zones (defensive and attacking) and a neutral zone. Three skaters from each team are allowed in the end zones. Even though ringette is played on the same ice-surface as hockey, comparable in equipment and numbers, the similarities end there. More similar to basketball, soccer or lacrosse, ringette is a team sport with a different strategy. The rules promote team play so that a single player cannot carry the ring from end to end and score a goal. Teams are usually made up of 11 to 17 players; with six skaters on the ice at the same time (a goalie, two defense, a center and two forwards). The Game begins much like soccer with the Visiting team being awarded a Free Pass in the Centre Ice Free Pass Circle (known in Hockey or Lacrosse as the Face Off Circles). Free Passes are also ringette's way of restarting games after penalties, violations, goals or any other stoppage in the game. Depending on where the play stopped after a violation or penalty, the free pass is awarded to the appropriate team in the circle closest to where the action ceased. One player takes possession on the whistle and has five seconds to either shoot or pass the ring to a teammate. The ring must be passed completely out of the circle, and the player cannot skate out of the circle with the ring. No other players are allowed in the Free Pass Circle during the five second count. Blue Lines - A player cannot carry the ring over a blue line in either direction. The ring must be passed over the blue line to another teammate. That teammate is permitted to skate ahead of the ring carrier and already be across the blue line before the ring crosses it. Goal Crease - If the ring lands in or on the crease, the only player who can touch it is the goalkeeper. The goalkeeper usually picks up the ring and throws it to a teammate. The goalie has five seconds to pass it out of her crease. Ringette promotes a no-contact policy when it comes to the physical aspect of its game. Penalties are given when a player, intentional or not, makes excessive body contact with another player, checks a player too high on the stick, trips, hits or interferes another player.